Silvio Berlusconi is to go on trial on 6 April, charged with paying an underage prostitute and then trying to cover up the alleged offence by abusing his position as Italy's prime minister. All three judges named for the trial are women. As opposition MPs called for the prime minister's resignation, his justice minister, Angelino Alfano, said the judge's decision had implications for "the autonomy, sovereignty and independence of parliament". Alfano said that, by indicting Berlusconi, the judge had ignored a vote on 3 February in which the chamber of deputies voted not to agree to a search request from prosecutors investigating the prime minister on the grounds that they did not have the necessary jurisdiction. A Milan judge, Cristina Di Censo, ruled that Berlusconi should be sent straight to trial, without committal proceedings, accepting the prosecutors' view that the usual procedures should be waived because of the "obviousness of the evidence" against him. The prime minister risks up to three years in prison on the juvenile prostitution charge and up to 12 years on the charge of abusing his official authority, which is a crime in Italy. Judge Di Censo's decision represented a new blow for Italy's billionaire leader, whose government is already struggling with the problems created by a thin majority in the lower house of parliament. On Sunday, half a million women turned out to protest at Berlusconi and the entrenched sexism they accuse him of representing in one of the biggest demonstrations seen in Italy in recent years. Until now, the prime minister has been secure in the knowledge that he could bank on the support of the xenophobic and populist Northern League. He was given an ominous hint that the League might be preparing to shift its allegiance: its daily newspaper, Padania, hosted an interview with Pierluigi Bersani, the leader of Italy's biggest opposition group, the Democratic party (PD). 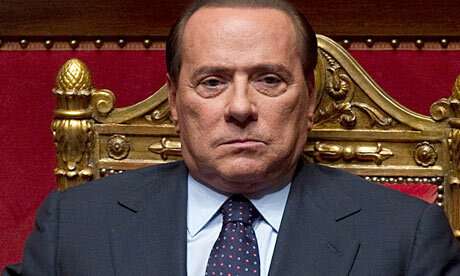 Dario Franceschini, the parliamentary leader of the PD, said: "Berlusconi must resign. He should leave the prime ministership. He should stop making us the laughing stock of the world. He should free Italy." The spokesman of the prime minister's Freedom People movement, Daniele Capezzone, said the forthcoming trial represented an "attempt by the left [which has been] defeated both at the ballot box and in the parliamentary chamber to use a judicial short-cut for a stab in the back". Under Italian legal procedure, the victims of an alleged offence are identified at the start of the proceedings. In this case, they are Karima el-Mahroug, a young Moroccan former runaway who was a guest at parties in Berlusconi's villa outside Milan, and the ministry of the interior. Prosecutors maintain that the prime minister, who denies any wrongdoing, paid Mahroug, who adopted the nickname of "Ruby Heartstealer" for sexual services while she was still 17. Berlusconi's lawyers are expected to argue she is older than indicated on official documents. Last May, Mahroug was taken to a Milan police station accused of theft. Instead of being returned to care, she was released to a regional parliamentarian from Berlusconi's party who has since been placed under investigation, suspected of aiding and abetting prostitution. The young Moroccan was handed over after the police, who are answerable to the ministry of interior, took a call from Berlusconi in which he claimed that she was the granddaughter of the Egyptian president, Hosni Mubarak. Berlusconi's lawyers have insisted he believed this was the case and that he stepped in to avoid a diplomatic incident. Shares in Berlusconi's Mediaset TV group fell 1.7% on the news. The judge's decision came against a background of reports that the prime minister's private life is at the centre of yet another inquiry, this time into parties held at a castle on the outskirts of Rome which he occupied last summer. He rented part of Tor Crescenza castle from its noble owners, ostensibly so as to be close to the centre of political activity at a time when his government was already in crisis. This article was published on guardian.co.uk at 15.39 GMT on Tuesday 15 February 2011 . It was last modified at 15.39 GMT on Tuesday 15 February 2011 . It was first published at 11.26 GMT on Tuesday 15 February 2011 .